World No Tobacco Day is annually observed on May 31 by many countries around the world. This observance was created by World Health Organization in 1987. During the years the celebration of this day is met both with enthusiasm and resistance. Observance of this day is met with enthusiasm by public health organizations and governments, but it's resisted by, smokers, growers of tobacco and tobacco industry itself. 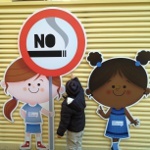 Tobacco industry makes everything possible to replace quitting or dying smokers with younger consumers, that is why different advertisements can be seen everywhere to attract youth to smoking. World No Tobacco Day is intended to encourage the smokers for a 24-hour period of abstinence from all forms of tobacco, and raise public awareness of connection between widespread use of tobacco and negative health effects. Annually about 6 million people die of diseases caused by smoking. About 600,000 of non-smokers die due to passive smoking. Every year WHO chooses a theme for the day, that helps create a more unified global message. Brochures, posters, fliers, press releases related to the theme are distributed among people.